Our hinged French doors provide easy access to your patio or exterior. We use traditional craftsmanship together with advanced energy-efficient technology to create a modern classic. These doors have a wide board stile and rail construction with mortise-and-tenon joints to improve performance and reliability. Their exterior wood door panels come with a urethane base finish for long-lasting protection. They also come standard with our energy-saving High-Performance™ Low-E4® glass. As an expert in replacement doors, we also offer sliding French patio doors for homeowners who want a classic style but also want to save on space. 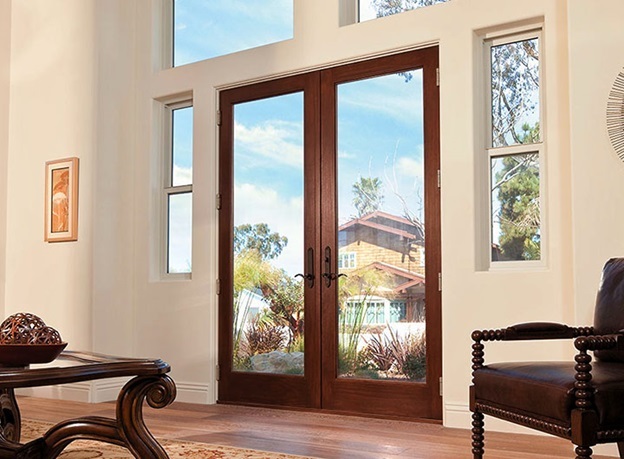 Our Frenchwood® sliding patio door has the traditional look of French doors, but operates by gliding on a track. It also features our energy-saving glass and comes with a reach-out lock system for weathertightness, security, and energy efficiency. Its doorframe also has a rigid vinyl sheath to minimize maintenance requirements. Lastly, our sliding contemporary doors have a sleek and modern door design. Their thin frames allows for maximum glass area. This can help create a smooth transition between your interior and patio. Our Andersen Narroline® sliding patio door has a stainable pine interior, while our Andersen Perma-Shield® sliding patio door has a rigid vinyl surface. Both these doors glide smoothly on dual ball-bearing rollers with self-contained leveling adjusters. For best results, you can pair our patio doors with some of our large replacement windows. This will create a beautiful wall of light for your interior. It also creates a seamless transition between your patio and interior. Since both products have our energy-efficient glass, you don’t need to worry about increased heat or energy bills. We serve Northern Las Vegas, Green Valley, Summerlin, Boulder City, and Henderson. Call us at (702) 722-2052 to learn more about our patio doors. You can also schedule a free in-home consultation.